A stylish and comfortable thong that can be dressed up or down. Soft leather upper and lining. Outer straps are connected by metal ring. Slip-resistant sole. This amazing slide will go wherever you do. Suede upper with hardware detailing. 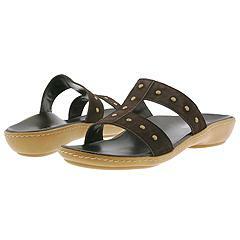 Footbed is lightly padded with great arch support. Leather lining. Slip-resistant island sole. A fashionable yet comfortable boot made to walk, work and play in. Accented with beautiful contrast stitching. Plush shearling lining. Rich, cozy suede upper. Cushioned footbed for maximum comfort. Crepe wedge sole. 8 1/2" shaft height and 11 1/2" calf circumference. 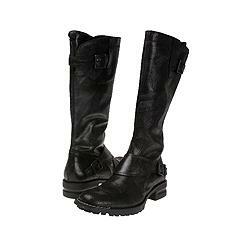 A stylish knee-high boot featuring beautiful buckle ornamentations. Distressed leather upper. Side zip entry for easy on/off. 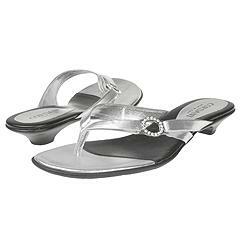 Cushioned footbed for maximum comfort. Slip-resistant sole. 12 1/2" shaft height and 13" calf circumference. A stylish yet comfortable boot made to walk, work and play in. Leather upper and lining. 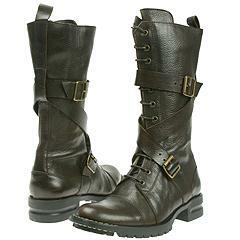 Features lace-up plus a side zip entry for easy on/off. Cushioned footbed for maximum comfort. Slip-resistant sole. 10" shaft height and 11 1/2" calf circumference.